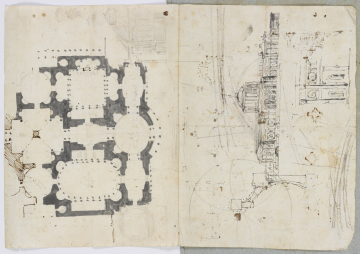 On the verso are rough studies by Dance for a (generic) mausoleum on a trefoil plan that, it is assumed, became a preliminary design for the so-called Mausoleum for the Earl of Chatham died 11 May 1778 (q.v. drawing 1). The two drawings are in different media on worn and rather scrappy paper and were probably made on two distinct occasions. The puzzle is that the drawing sheet is Italian-made.